The Zune HD launched on Tuesday and there has been a lot of good reporting on the launch. I haven’t had a chance to play with either the Zune HD or the Zune desktop software (because I don’t own a PC) but hope to get my hands on them soon. Nate Anderson reviews the Zune HD for Ars Technica. Regardless of how you’re trying to navigate, the on-screen keyboard seems to require more finger accuracy than the fault-tolerant keyboard on the iPhone (probably because of the smaller screen). The back button is hard to hit–I kept selecting the favorites menu by mistake. Sites are also considerably slower to load, and the resolution doesn’t seem to be nearly as good as the iPhone or iPod Touch, with a noticeable flicker on pages with white backgrounds. Zune Originals artwork are now available for the Zune HD from the Zune Store. Electronista reports that Zune 4.0 is available for download and adds 720p HD rentals and applications. Engadget has found that there are “other touch-screen Zune players” referenced in Zune HD manuals. Zune HD also features new casual games and non-gaming functionality such as a calculator and an MSN Weather application. Later this year, Zune plans to release free applications such as Twitter for Zune and Facebook for Zune, in addition to fun 3-D games such as “Project Gotham Racing: Ferrari Edition,” “Vans Sk8: Pool Service” and “Audiosurf(TM) Tilt.” Games can be added to Zune HD via Zune Marketplace over the Wi-Fi connection or when connected to the Zune PC software. 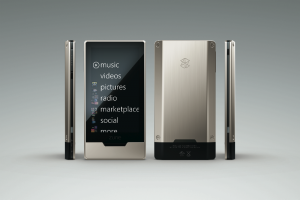 JuniorTekLive has posted the first Zune HD commercial to YouTube. The ads show up during app launch, which takes an astonishingly long time. Booting Chess took 30 seconds, […] Launching the weather app takes about 8 seconds, the calculator about 9. Goo Splat, which has been showing a static ad this morning for the Soul, launches in about 17 seconds. Update 11/12/09: Korneel De Feyter reports that there have been some additions to the Zune apps Marketplace. PGR: Ferrari Edition, Lucky Lane Bowling, Vans Sk8, Audio Surf: Tilt, and Checkers have all been added. These are the first 3D games to be added to the Zune HD.